As Ange at Fonts and Fiction has kindly given me the Friendly Blogger Award I have taken some time to consider who to pass this on to. Sally Jenkins- who is another friendly person who shares info and competition news. Shirley- a lovely friendly person who shares her writing highpoints and actually is a very good poet too. 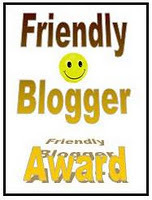 Other friendly bloggers have already been highlighted by other winners, and I too would have added them to my list, among them, Patsy, Teresa, Sally and Keith. Friendship is wonderful, online and off. So thank you all. Thanks Carol for the award and the lovely sentiments. You've really cheered me up. Thanks again. It's good to find other friendly bloggers to check out, Carol! Thanks for thinking of me, Carol. Carol - thanks for the award. I feel quite honoured to have been chosen! Thank you Jennifer, and Sally. I hope you will share the details of some interesting blogs too. You're right Rosemary. I've found some really good blogs from friendly bloggers.